I was headed out of town to visit family for the Easter holiday last week and made my very first visit to new Terminal 2 at RDU Airport to catch a flight. The new terminal is very bright and slick looking. I snapped the picture above as I made my way to my flight’s departure gate. I had no idea that the 42nd Street Oyster Bar had a second location in Raleigh. Until last week I was only aware of their location in downtown on West Jones Street. 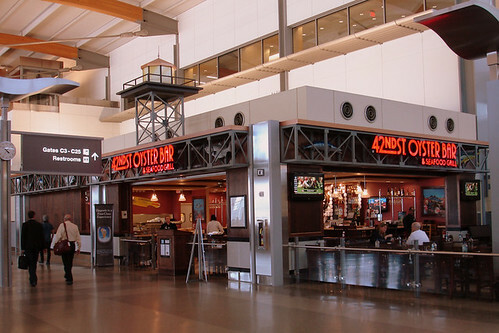 It is interesting to see them branch out and open a second restaurant out at the airport. I was pressed for time and couldn’t stop to eat, but I hope to try out the food at this location on a future visit. Two thumbs up overall for the new Terminal 2 out at RDU!